This outfit is designed to fit 18 inch Adora dolls, Madame Alexander dolls, and many other 18 inch dolls. There are noted classics in the fashion world and this outfit has two of them: Animal prints and cape styled outerwear. This cape features a longer length and a hood for added styling. Two pom poms on satin ribbon serve as ties to keep the hood up or just for added details. The matching fur boots feature the same pom poms which are tied and attached to the front of these zippered boots. Doll and leggings not included. 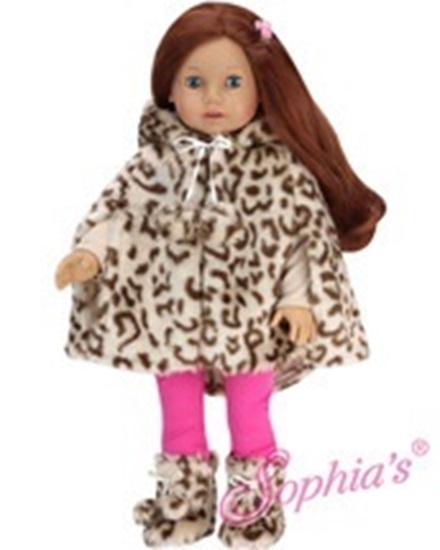 Fits most 18 inch dolls like Sophia's, American Girl and Madame Alexander.